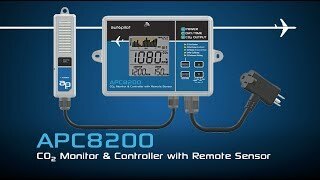 Autopilot APC8200 CO2 Monitor & Controller with Memory offers a simple and affordable way to control, monitor and record CO2 levels over an adjustable period of time. Trace your room's CO2 levels over minutes, hours, or up to 7 days with this easy-to-use controller. The APC8200 also boasts a fully customizable CO2 setpoint and deadband. Adjust and review your CO2 levels when you want to and how you want to. The APC8200's memory feature gives growers a real edge in fine-tuning the grow room environment. Optimize your CO2 levels with this precision controller from Autopilot! Err4 IR lamp error Please reconnect power adapter, if the Err4 still appears, please contact the service department. Err5 Internal parameter error Please reconnect power adapter, if the Err5 still appears, please contact the service department. Err6 Sensor unit Connect Error Please reconnect sensor unit and redo power on, if the Err6 still appears, please contact the service department. Err7 temperature or humidity error Please turn off power adapter, and put the device in a dry place more than 12 hours. Err8 Internal calculate error Please reconnect power adapter, if the Err6 still appears, please contact the service department.